Harbour-lights we see. Soon our voyage will be past, And the anchor we shall cast We on land safe home at last. Joyfully we come. See our dear ones quickly gather! There is Mother! there is Father! Oh,we're glad to see you, rather! The children must stand in a row, or rows, according to space at command. The hands must be waved to and fro with the palms uppermost, (the reverse of the position of the hands that wave in the"Tree- Song.") and the undulations of waves must be carefully imitated, and continued through the first three verses with these exceptions,-viz, the sixth line of the first verse, when they must point up at imaginaryclouds,-the third line of the second verse, when they must imitate tossing, with both hands,-the fifth line of this verse, when they must beckon at the words "This way;"-and the second and third lines of the third verse, when they must shield their eyes with their hands, as if looking over the surf at the "harbour lights." At the fourth verse they must scamper with well raised and bent knees, not in long but high steps, for the first four lines; suddenly stand still at the fifth, and point to the imaginary "dear ones," singing the words as rapidly as possible, till "rather" is reached, and that word must be spoken in quite anaturaLbut very arch tone of voice. 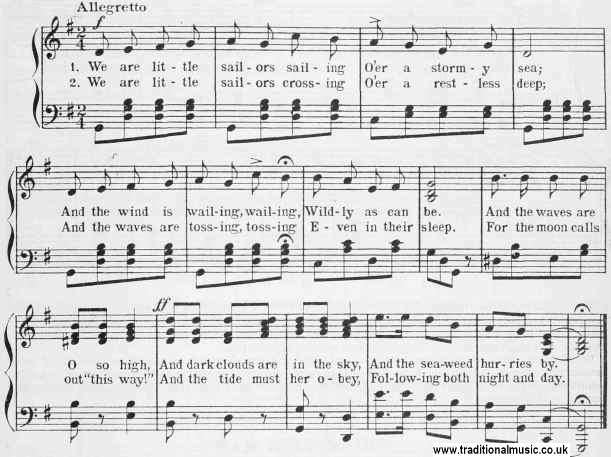 Then sing the first four lines lines of the song with sea-wave action.by way of a finale.